The names of the men – a 58-year-old from Greenland and a 67-year-old from Menominee Township – are being withheld pending their arraignments in the respective county district courts. In Menominee County, during the firearm deer hunting season, a mortality signal was received from a 1-year-old male wolf on Nov. 19. 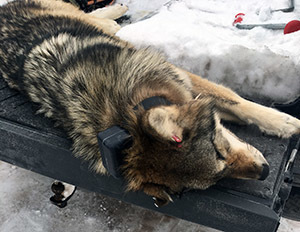 In an interview with conservation officers this week – the same day the confession was obtained in the Ontonagon County case – the man from Menominee Township confessed to killing the wolf. He was one of the original suspects developed in November. Suspected poaching violations may be reported 24 hours a day, seven days a week to the DNR's Report All Poaching hotline at 800-292-7800. Wolf: A gray wolf shot in Ontonagon County Saturday is shown. A Greenland man has admitted to shooting the animal with a rifle.